The MIXXFM, Speedway Sedans Australia, National Production Sedan Title is just days away, with Gemma Laidlaw set for another National Title campaign at the Western Speedway, Hamilton. 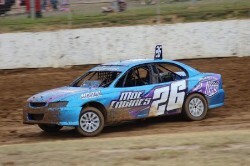 Competing in her third National Production Sedan Title, Laidlaw has made massive improvements since debuting at the age of eighteen. Maryborough was hard and fast racing which made me realise that if I could race that hard at every meeting, I would do better and get better results, which I have been getting better results at the end of last season and start of this season, she said. Laidlaw has raced at Hamilton three times over the last few seasons, the first in a state title in a Senior Class, HEC Hellraiser February 2018 where she finished second in the Feature race behind her father, Stephen Laidlaw, and then in December, Gemma Laidlaw was able to win the Feature Race at the home of the National Title. Laidlaw recently competed in the Victorian Production Sedan Title, and by her own admission, she had an up and down night. I had an up and down night, having a good run in the first heat, got put to the rear of the field for a racing incident in heat two, before blowing the diff in heat three, all before finishing up ninth in the final. I certainly will be doing things differently, hopefully less damage and try my best to make it to the A Main, Laidlaw adds. Laidlaw is part of a racing family and is also looking forward to the social side of the weekend. I always love the social side of the titles, but this year I am looking forward to focusing more on myself and team and getting the best possible result we can, as coming off a win recently at the track I would love to try and make the top 10 providing everything runs smoothly, Laidlaw said. The event is full of top drivers and Laidlaw is fully aware of the task ahead of her. There is definitely a lot of Drivers to beat, as Australian Titles always bring the best out, just hoping I can run with them this year, but for sure all the West Aussie boys and Queensland Boys will be hard to beat, as they race more often then what we do, Gemma explains. Gemma Laidlaw would like to thank the following sponsors.